The Wild Trout Trust (W.T.T.) conservation officer Dr Tim Jacklin, visited Barningham Moor on Friday 13th June to carry out a survey of the moorland tarns and their population of what JFF believe to be indigenous wild brown trout. 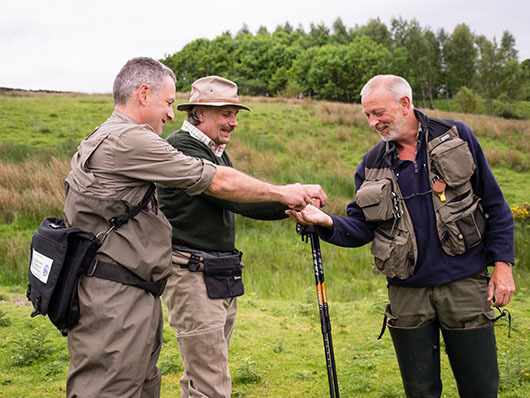 Michael Brown of JFF (centre) guided Dr Jacklin (left) on a tour of JFF's fishery, Cow Close Lake (aka Barningham), and it's main feeder Goredale Gill. The survey continued to the higher level tarn above Haythaite Farm, an area normally reserved for grouse shooting. Special permission was granted to the W.T.T. 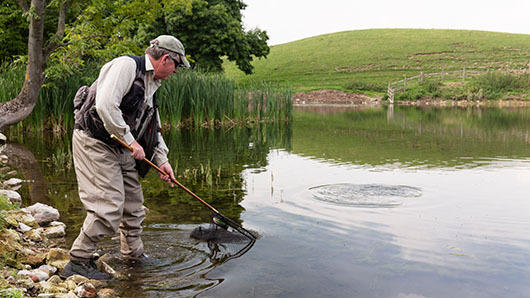 survey to fly fish this tarn, which the owner believes has its own head of indigenous brownies. A steely blue backed, brown trout with handsome red spots of about 9" was later returned. Offers from 3 other fish during a hours fishing appeared to provide clear evidence of another, possibly smaller, population of indigenous fish. A report from the survey will be issued to JFF by the W.T.T. with their recommendations for conserving what appears to be a relatively rare natural resource in this area. At the time of writing (29.4.2014), the going in the fields which lead to the river car parking is best described as a bit soft, so take care if you do not have four wheel drive. If you do have four wheel drive, still take care, not only to preserve the grazing, but for fear of sheep. There is a strong rumour that a member of the committee (we are looking at you, Bisby) caught a two pound trout in a puddle in Jervaulx park on April 1st, using a midge pattern so small that it didn't officially exist. It is also said that this unnamed member returned the alleged trout to lake two, where it is still swimming around, a wiser fish. Can any trout reading this page please ensure that they do not leave the safe environment of the lake next time any flooding occurs? Although puddles are fine places, they do not make suitable long term trout habitat and leave fish vulnerable a. to being run over, and b. to being caught by people who tell tall stories afterwards. Ian Burdon very kindly repaired the breach in the dam on lake one late last season. We were on tenterhooks for a while, because the level actually fell after the repair, but we needn't have worried because the winter took care of that. The back casting is quite restricted because of the trees, but this lake has a reputation for nurturing some very fine trout which become extremely testing to catch. It is quite a good place to fish on a windy day, or when the sun is blasting down, because of the shelter from the trees. Jervaulx No 2 lake had another weed cut on 1st August last year by our contractor Olsten Trout and thanks to the combined efforts of those listed below the lake is now a beautiful clear sheet of water and looks great for unhindered fishing. Without the efforts of all the people who turned up, the lake would be unfishable. A collection of cut mares tail which had been blown to the north western corner was hunted down by a final work party on August 3rd and a very enjoyable time was had by all. Not only do trout now rise all over the lake, you can catch them all over the lake, without any fear of them diving into cover and never coming out again. Weed cutting is a vitally important part of maintaining the quality of our fishing and although we employ a very effective contractor, we rely heavily on our members to help. It is very hard to stress how much you owe it to yourself to turn up and lend a hand. Yes, effort is involved, but the work parties are critical as far as our fishing is concerned, however, (even allowing for a certain resemblance to an episode of Last of the Summer Wine) every weed cut has been tremendous fun and has provided a terrific opportunity for meeting other members. Looking at the fantastic result we have achieved on lake two, just imagine what we might do with the other lakes if we had more help? Come on guys! Last season, one of the best conditioned rainbow trout ever seen at Jervaulx was caught and released in this lake - see the stories page for a photo - and it would be fantastic if enough members volunteered to allow us to be able to keep the weed under control, as well as keeping lake two in good shape. Remember, your fishing depends on it!